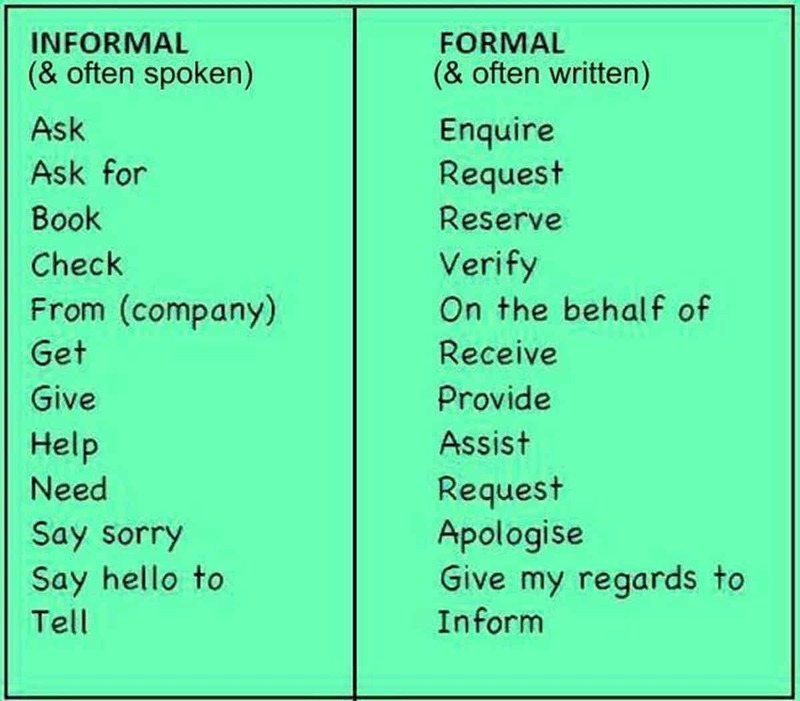 Informal and Formal English: What’s the Difference? 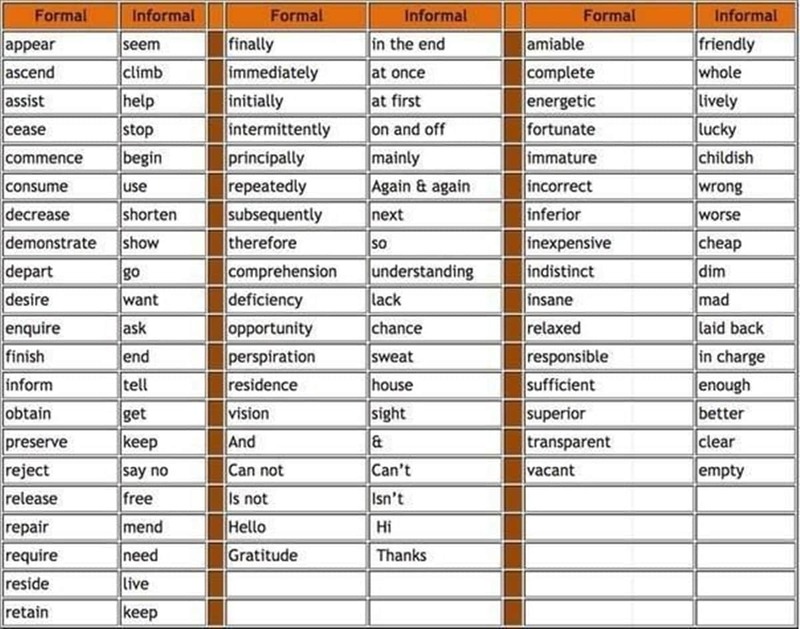 Formal language is less personal than informal language. 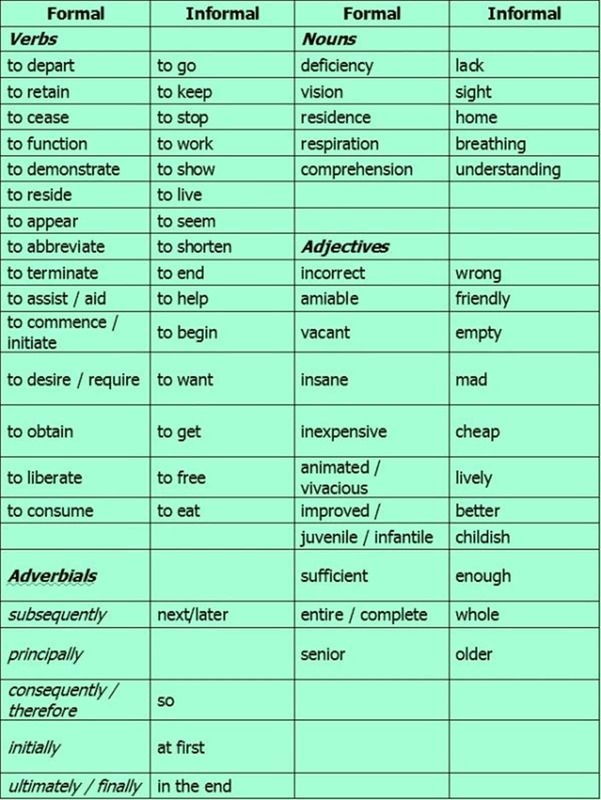 It is used when writing for professional or academic purposes like university assignments. 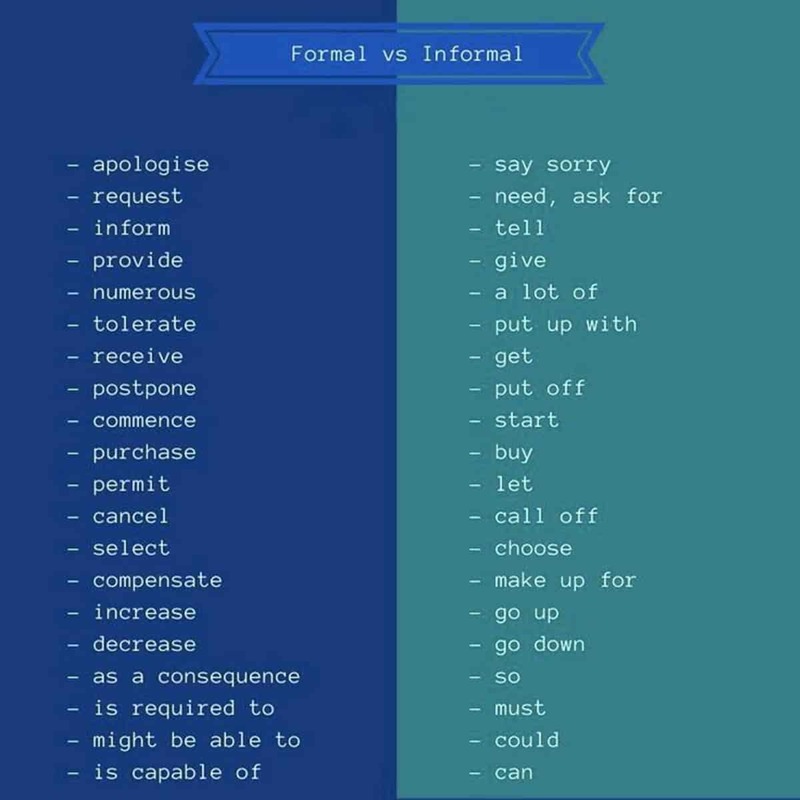 Formal language does not use colloquialisms, contractions or first person pronouns such as “I” or “We”. Informal: The interviewer asked me about my future plans. Formal: The interviewer enquired me about my future plans. Informal: You can ask for a free copy of the leaflet. Formal: You can request a free copy of the leaflet. Informal: I’d like to book a table for three for eight o’clock. Formal: I’d like to reserve a table for three for eight o’clock. Informal: I’ll leave you to check whether these claims are true. Formal: I’ll leave you to verify whether these claims are true. Informal: We got a warm welcome from our hosts. Formal: We received a warm welcome from our hosts. Informal: The hospital has a commitment to give the best possible medical care. Formal: The hospital has a commitment to provide the best possible medical care. Informal: We are looking for people who would be willing to help in the group’s work. Formal: We are looking for people who would be willing to assist in the group’s work. 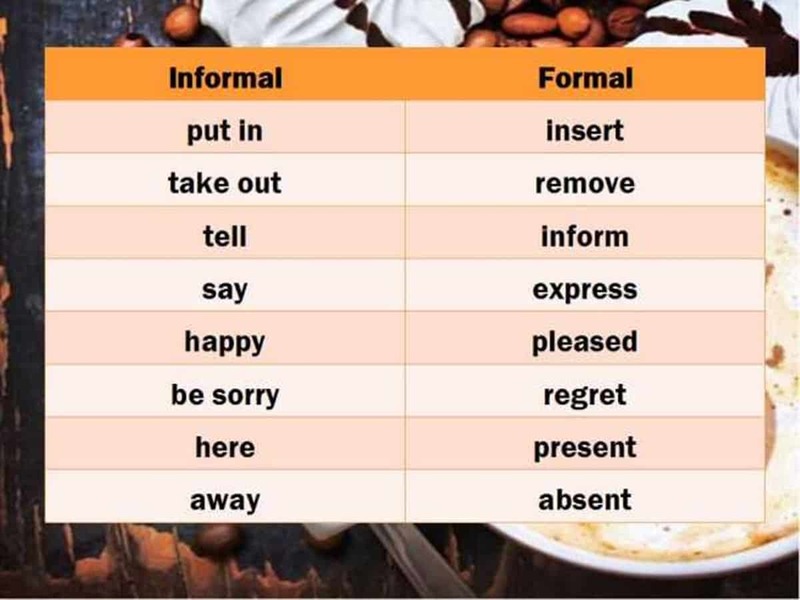 Informal: Go and say sorry to her. Formal: Go and apologize to her. Informal: Well, say hello to your wife and children. Formal: Well, give my regards to your wife and children. Informal: The leaflet tells customers about healthy eating. Formal: The leaflet informs customers about healthy eating. Informal: He hasn’t been chosen for the team. Formal: He hasn’t been selected for the team. Informal: Once that is completed, the major construction work will begin. Formal: Once that is completed, the major construction work will commence. Informal: She didn’t let me to live with my kids. Formal: She didn’t allow me to live with my kids. Informal: “I can promise you of that”, he said. Formal: “I can assure you of that”, he said. 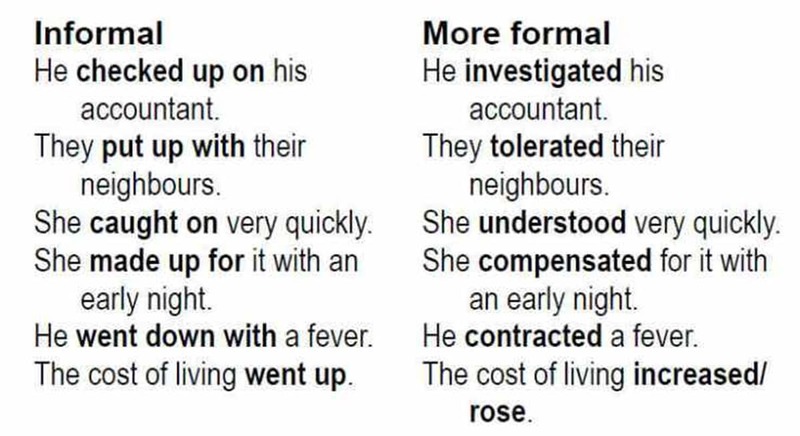 In informal English we use more common words and phrasal verbs. Informal: The door locked accidentally, and I couldn’t get out of the room. Formal: The door locked accidentally, and I couldn’t escape the room. Informal: It’s too soon to say if he’ll get by. Formal: It’s too soon to say if he’ll survive. Informal: The two men managed to get away from the police for six weeks. Formal: The two men managed to elude the police for six weeks. 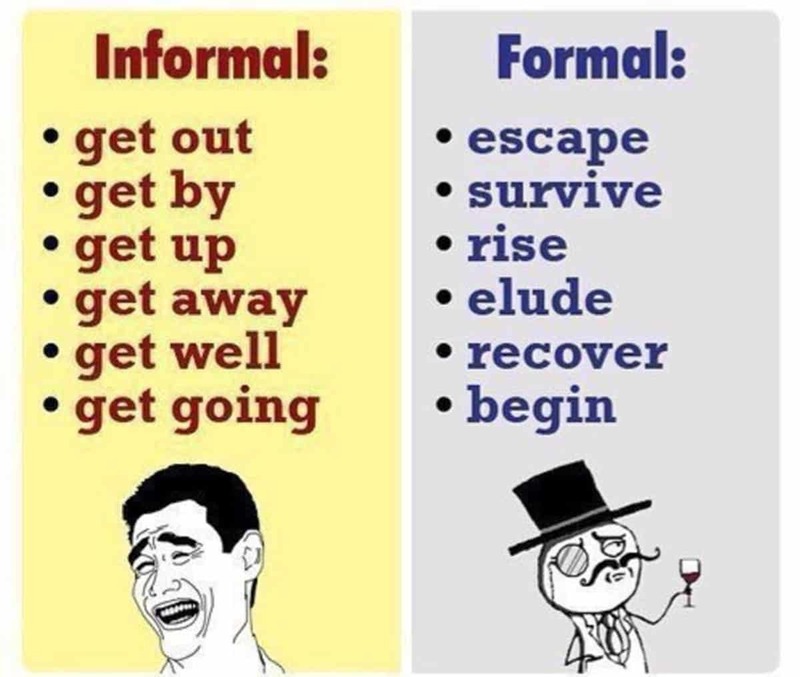 Informal: Come on, you guys, let’s get going! Formal: Come on, you guys, let’s begin! Informal: He checked up on his accountant. Formal: He investigated his accountant. Informal: They put up with their neighbours. Formal: They tolerated their neighbours. Informal: She caught on very quickly. Formal: She understood very quickly. Informal: She made up for it with an early night. Formal: She compensated for it with an early night. Informal: He went down with a fever. Formal: He contracted a fever. Informal: The cost of living went up. Formal: The cost of living increased/ rose.